This article will describe usage of Docker. Image is an immutable root filesystem created from Dockerfile. Image is not used at runtime. Container is a mutable root filesystem created from image. Container is used at runtime. For example, the following command will result in as below. Download hello-world image from remote server. Container with a random name is created from image. A binary hello specified by CMD in Dockerfile outputs "Hello from Docker!". Running binary hello on host machine outputs the same. But this is not the same environment. There are two way. One is running "docker run". Another is "docker pull", "docker create" and "docker start". Running the following "docker run" will download <image> and run <cmd> on <container>. Omitting –name <container> creates random name. Omitting <cmd> uses CMD in Dockerfile. You can use ID to <container> and <images>. This "docker run" is same with the following commands. If omitting "docker pull" and <image> is not exist, "docker create" will download <image> from remote server. "docker pull" is a command for downloading image to local. Image is downloaded from remote server called Registry. The default registry is Docker Hub. Because "docker create" search will image from local first, you can download images that you will use in advance. When creating local Registry, you need to run "docker run" first, and then push image to local Registry. "docker create" is a command for creating container from image. You need to be careful with -it option. If -it option is not specified, bash will be terminated and container will be stopped immediately. $ # This is host machine's shell prompt. If -i option is not specified, bash does not accept stdin. If -t option is not specified, pseudo-tty will no be created. TERM variable will be empty and prompt string will not be displayed. If -it option is specified, bash is done normally. "docker start" is a command for starting container. If -i option is specified, attach to the container at the same time as starting the container with connecting stdin. The following command is almost same with "docker run", except that it returns to host machine between start and attach. There is -a option similar with -i option. If -a option is specified, attach to the container at the same time as starting the container without connecting stdin. This article will create image which has a emacs package with using ubuntu:16.04 as a base image. This image does not have a emacs package. After installing emacs, terminate bash and stop container. Create image from container with "docker commit". Create container from created image. This image has a emacs container. Create image from Dockerfile with "docker build". Temporally container will be created. $ docker build -t ubuntu-1604-emacs-dockerfile . 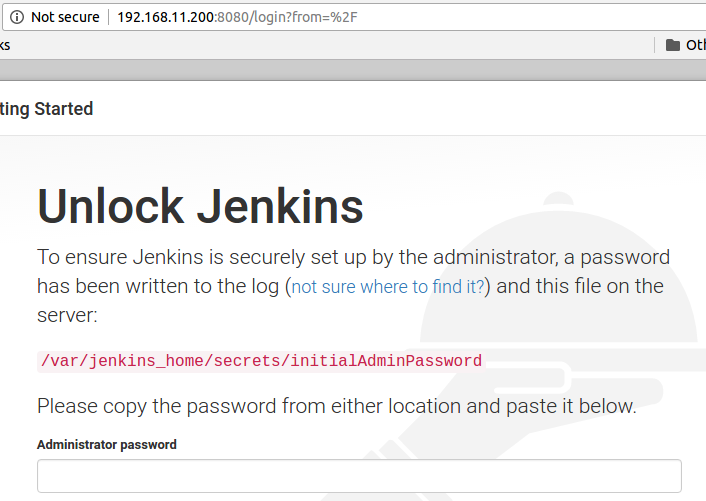 This article will access to Jenkins on container from external network. Jenkins will use 8080/tcp. Docker has three network by default. If ommitinig –network option, bridge network will be used. bridge bridge network has a bridge names docker0. This needs port forwarding for accessing from external network. host host network uses host machine's NIC apparently. External network cannot access to this. none none network does not create NIC. NIC of this article is as below. eth0 Host machine's NIC. IP address is 192.168.11.102/24. docker0 The bridge which is created when starting docker. IP address is 172.17.0.1/16 assigned by bridge network. Map 80/tcp on host machine to 8080/tcp on container. Omitting –network option specifies bridge network. 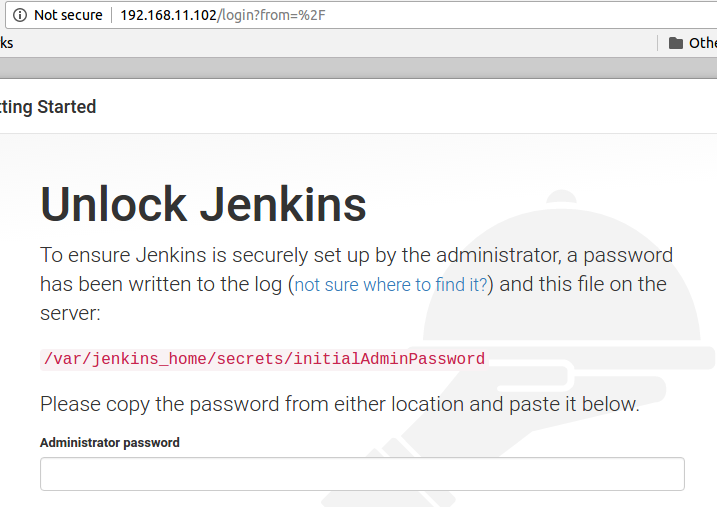 Accessing 80/tcp on host machine will display Jenkins. Create another bridge which is L2 layer. The following article will create bridge names br0. Created bridge is as below. br0 This is a bridge independently of docker. IP address of br0 is 192.168.11.102/24. IP address of eth0 is empty. Create network which has a br0 with "docker network create". Create container that network is br0_network, IP address is 192.168.11.200 and DNS is 192.168.11.1. This DNS value will be used by embedded DNS server (127.0.0.11). /etc/resolv.conf on container does not have this DNS value but have nameserver entry to embedded DNS server (127.0.0.11). Accessing to 8080/tcp on container will display Jenkins. Because docker might not have IPAM driver for using external DHCP server, using user defined network needs implementation of DHCP (Or just write entry to dhcpd.conf) independently of docker. Though IP masquerade is false, L3 layer setting will be done. This will prevent bridge network working. If you need container without specifing ip, use host network instead of bridge network. When specifiying multiple –dns option and first DNS server returns REFUSED, the embedded DNS server will not send query to second DNS server. The embedded DNS server will send query when DROP and REJECT. I don't know this is correct working but my Windows, Linux and MacOS will access to second DNS server when first DNS returns REFUSE. docker <arg> is alias for docker image <arg> and docker container <arg>. docker rmi <image> Remove image. docker ps [-a] Show containers without stopped ones. docker stop <container> Stop container. docker exec <container> <cmd> Run other command on running container. "docker ps -q" shows only ID. The following command will stop all running containers.